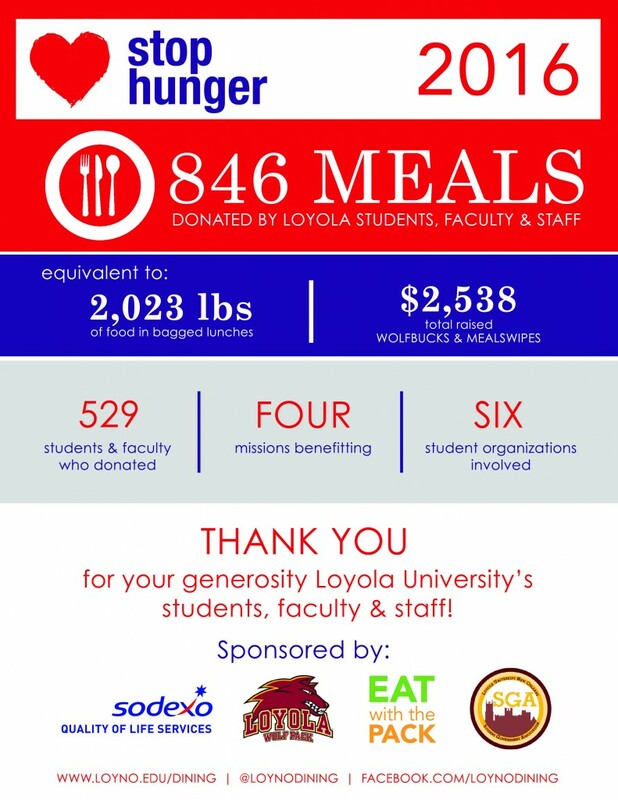 Last year, we partnered with Athletics to introduce a new program on to Loyola’s Campus under our annual Stop Hunger fundraising efforts during the Fall 2015 semester. One that would help students, faculty and staff give back to the community. This new program allowed students to donate their meal swipes to the homeless. 1 Meal Swipe = 1 Bagged Lunch. In partnership with SGA, Athletics and Residential Life, we were able to collect 300 meals and when students arrived back on campus in December, they were able to volunteer to build the meals and then deliver them to missions in the Greater New Orleans Area. The Loyola Community responded so well to this new program, that we decided to focus solely on collecting meal swipes in 2016. From November 1st though November 14th, students, faculty and staff could donate both meal swipes and wolfbucks. Through this years efforts, we raised 846 meals, which surpassed our goal of 600. Students will gather on December 4th to build the meals and deliver to multiple mission in the city. If you are interested in volunteering, please contact Daniella Alvarez, Marketing Specialist at daniella.alvarez@sodexo.com.